I am in full-swing pumpkin mode! I used my last Tablespoon of pumpkin in my Pumpkin Chocolate Chip Muffin in a Mug. Yes, I scraped the can with a spatula and hoarded my last Tablespoon in a plastic baggie in my refrigerator! That very day I was off to Walmart to buy more pumpkin! Imagine my great dismay when I found out my Walmart only carries pumpkin October through December! 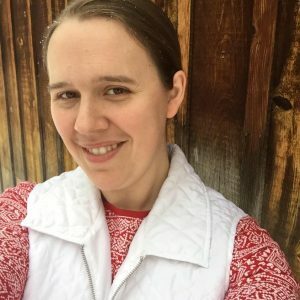 My husband told me that was a sign that I am starting pumpkin recipes too early, but I don’t feel that way (and hopefully you don’t either)! Thankfully, I was able to find pumpkin at another grocery store, and I’m back in business! The recipe I want to share with you today is actually one I have had ready for a while, and I’m so excited to finally be able to give it to you! 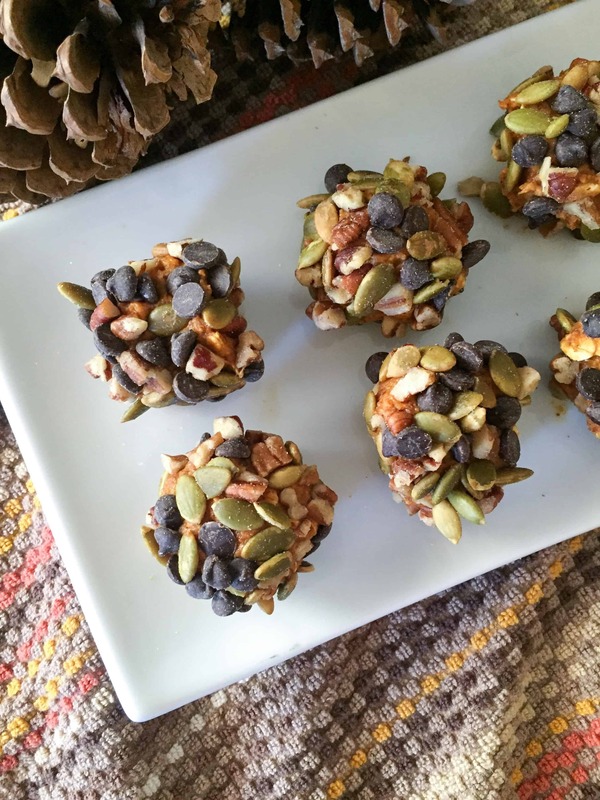 These little pumpkin bites are the perfect little pick-me-up snack. 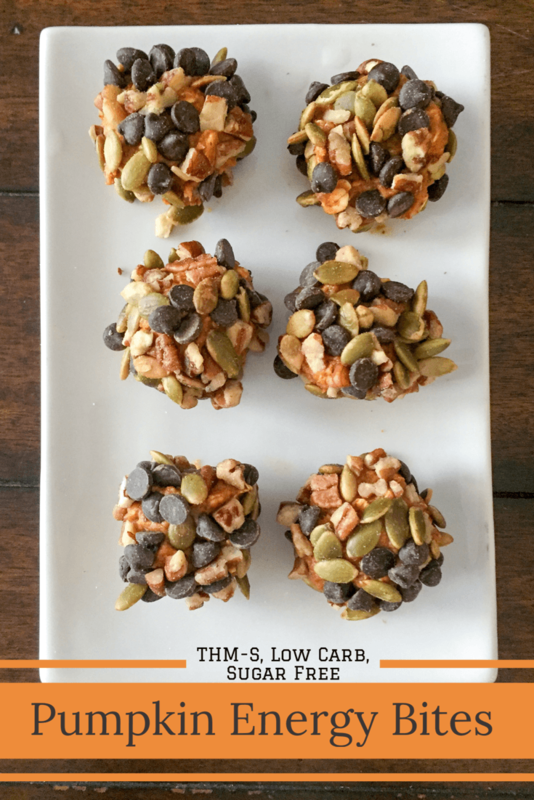 Sweet pumpkin mixed with almond butter and coated liberally with pumpkin seeds, pecans, and chocolate chips. They are so good! My husband and I are the boys dorm parents at a mission school, and my dorm boys (teenagers) were devouring these! They never even knew they were sugar free, so you know they are teenager approved! 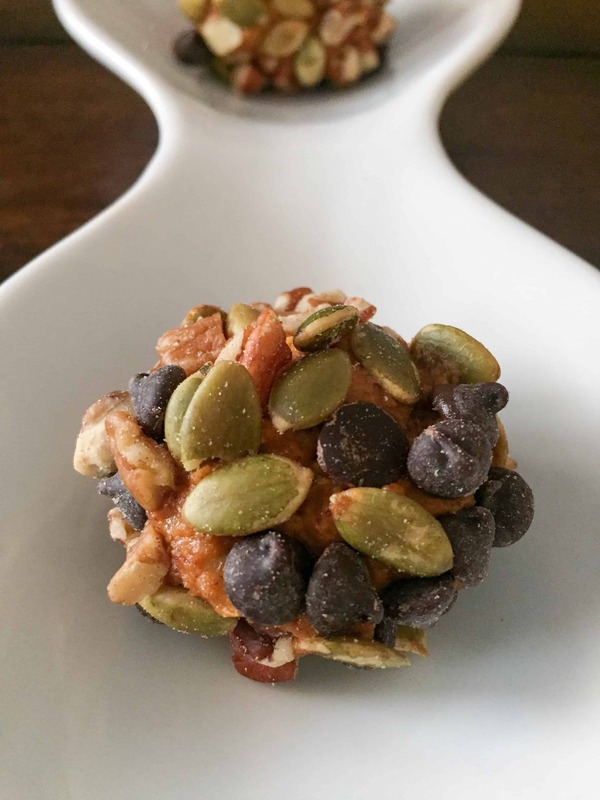 Combine pumpkin with almond butter, flax meal, Gentle Sweet, cinnamon, salt, and oats. 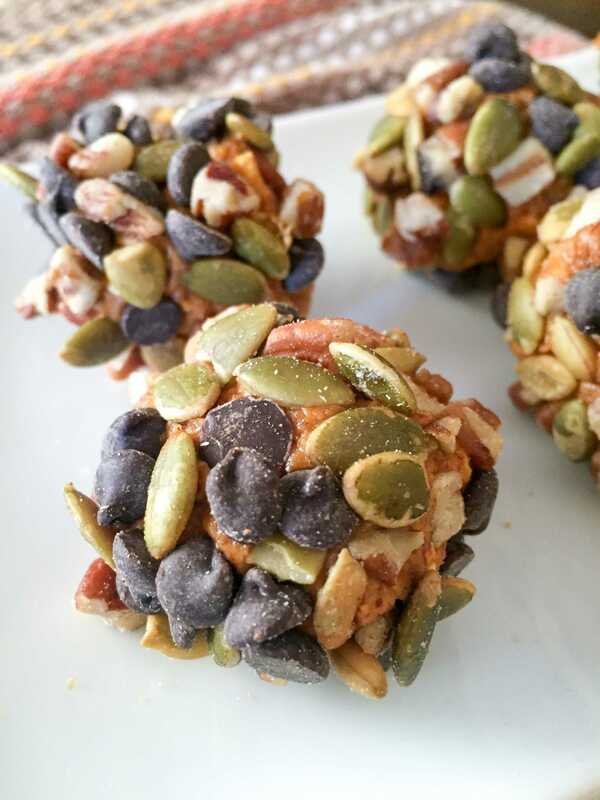 In a separate bowl, combine pumpkin seeds, pecans, and chocolate chips for topping. , place balls of pumpkin mixture in bowl of topping, then roll to coat. Hi…Sounds wonderful! I do see oats in the instructions. But I don’t see in the ingredient list. What do you mean by oats and what is the amount to be added? I too LOVE pumpkin!!! This looks so easy and delicious. I wish I had some right now to snack on! These look absolutely wonderful! Sharing today. Can peanut butter be substituted for almond butter? And, what are pumpkin pieces? I’m sure you could use peanut butter instead, though the taste would be different. I’m not sure what you mean by “pumpkin pieces.” There are pumpkin seeds in the recipe. How fun are these? 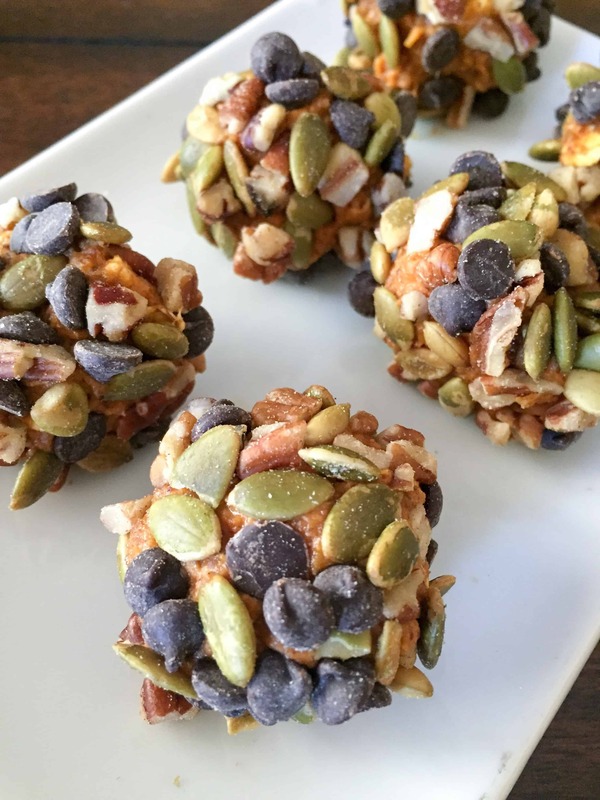 My kids aren’t that into pumpkin (it’s a textural thing), but I can tell you they would absolutely want to try these. Yum. Yummy! I don’t have flaxseed so could the baking blend be used in place of it? If not, I will just order some off amazon! These look amazing! How strong is the taste of the pumpkin? I don’t care for it and this is the first recipe I have found for something like this without coconut, which I have a REALLY bad taste aversion to. You can taste the pumpkin and spice, but you may like the peanut butter version (just omit the coconut flakes). You are rocking the pumpkin recipes! Yum! Is this used as a dessert or snack. How many are needed on the thm diet? I assume these need to be keep in airtight container in the frig? I am also wondering if they can be frozen? Yes, keeping them in the fridge would be the best option. I haven’t actually tried freezing them, but I think they would do okay! I freeze them. Take one out in the morning and by the time I get to work they are thawed and ready to eat! The texture doesn’t change at all. How many does the recipe make? I tried to print and didn’t see how many it makes or how many equals a serving. Hi Stacy! You should get between 12-14 “bites” and a serving size is 2. Enjoy! Is this an E or S and serving size please. This is an S fuel, and the serving size is 2 balls. Love this! Just really annoying that they put an ad in the recipe when you go to print it so you have an ad in the middle of your recipe! I added two scoops of the THM Pristine Whey Protein to the recipe, which I had doubled BTW. So that would be one scoop of whey powder per batch of mix. I didn’t change my fuel did I? It’s still a S, right? Just with more protein? I was trying to make the consistency less sticky…drier… but it didn’t work. They are GOOD, but I won’t add the whey again. Perhaps you could use flaxmeal? Do you think it would be OK to grind up the pumpkin seeds for kids who take one look at them and refuse to try?